An A2 envelope is nothing but an invitation kind of envelope which is used socially. This popular size envelope is preferred for RSVP generally. Many times you need to choose an A2 envelope template and then the difficulty starts in searching them. Our site provides an easy solution for this problem. We have Envelope Templates here and that too very simple to find. You can search the best envelope with smart flap, very easily on our site and make your job even simpler and up to the mark. The templates are available in PDF Ms word format which can be downloaded easily. 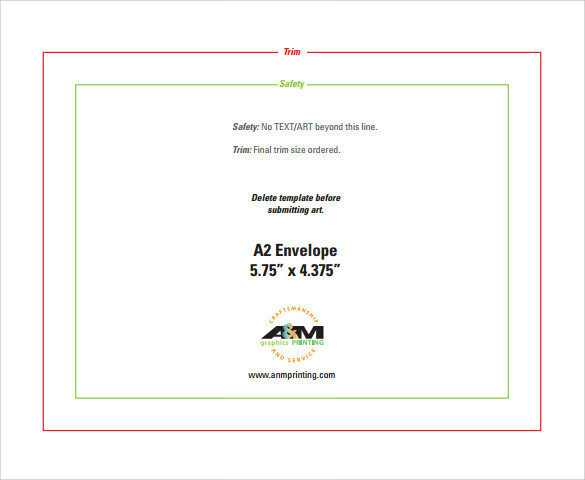 The A2 Envelope template is a very simple and basic envelope template. Its dimensions are 4.375” x 5.75”, 4.375 inches being the length and 5.75 being the breadth. The template gives a basic outline of the folds, which if printed and properly followed will give you a perfectly shaped envelope. 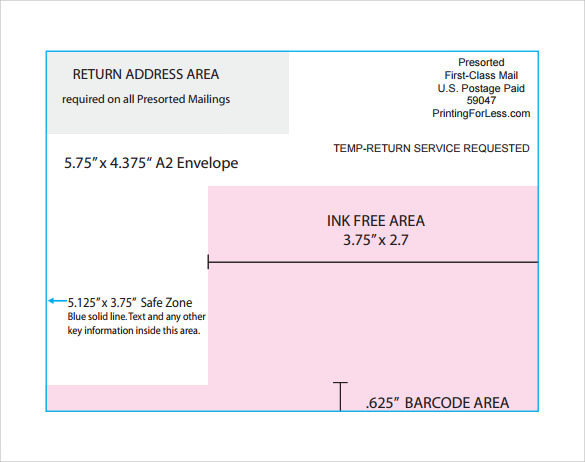 This sample A2 envelope front template is ideal for usage if there must be printing in the front of the envelope. The grey area here denotes the size of the envelope. There is a space left for the stamp. The return address to be places on the top left as mentioned. The mailing address must be centrally placed. The post office barcode area is to be at the bottom of the page. The dimensions of the page are 4.375 x 5.75 inches. 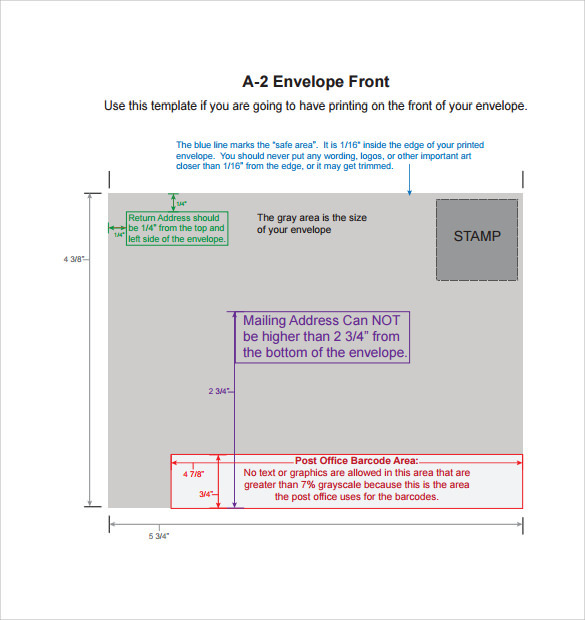 This A2 envelope serves as an example to instruct the users about how to prepare an envelope from a template. 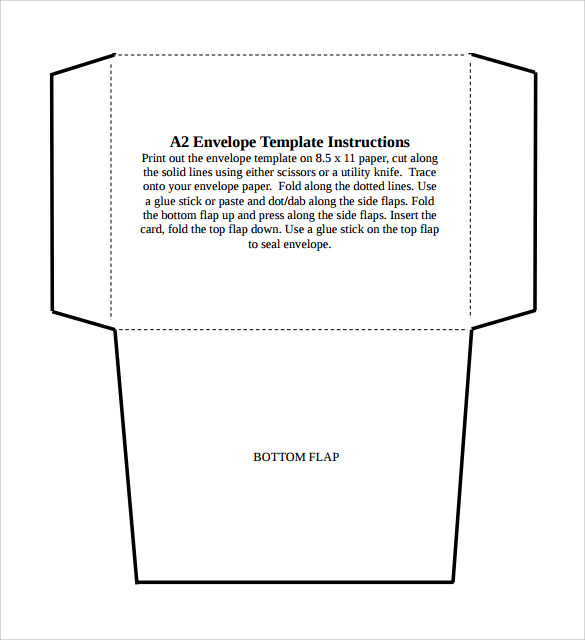 The instructions require you to print out the template, cut along the solid lines, then fold along the dotted lines, paste the side flaps, fold the bottom flap and press along the side flaps, insert the card, fold the top flap down and finally use a glue stick on the top flap to seal envelope. 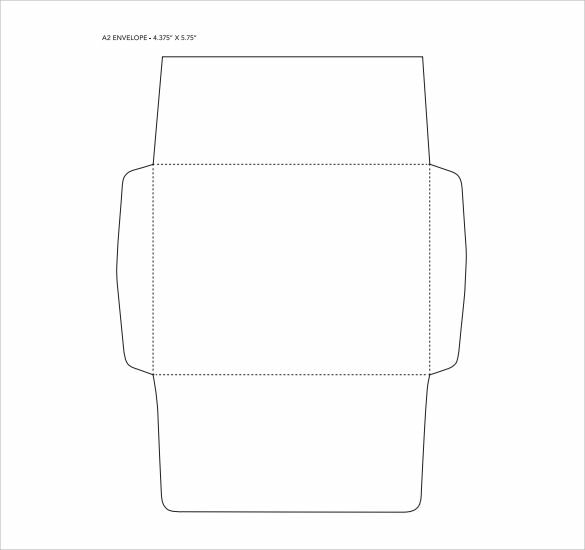 This downloadable A2 envelope has the dimensions of 4.375 x 5.75 on the face and can hold a card with the dimension of 4.25 x 5.55 or below. All the figures are denoted in inches. 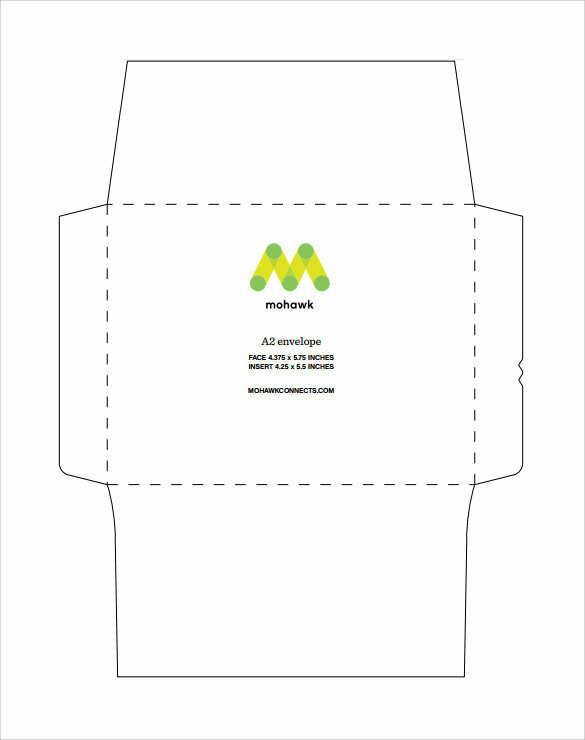 Brought to you by mohawkconnects.com, this envelope template can also be printed out and then cut and folded into a real envelope. Just print out the template, cut along the solid lines, then fold along the dotted lines, paste the side flaps, fold the bottom flap and press along the side flaps, insert the card, fold the top flap down and finally use a glue stick on the top flap to seal envelope. A2 refers to a specific size or dimension, i.e. 4.375 x 5.75 inches. Envelope templates look nothing like traditional templates. Envelop templates are nothing but computerized formats of templates. That is they only exist in soft copy and hence don’t have the need to have any specific shape or size. Envelopes are supposed to carry postcards or letters but an envelope template can hardly be distinguished from the postcard or the message it carries. What Are The Benefits Of A2 Envelope Templates? Preparing an envelope template can be very complicated. 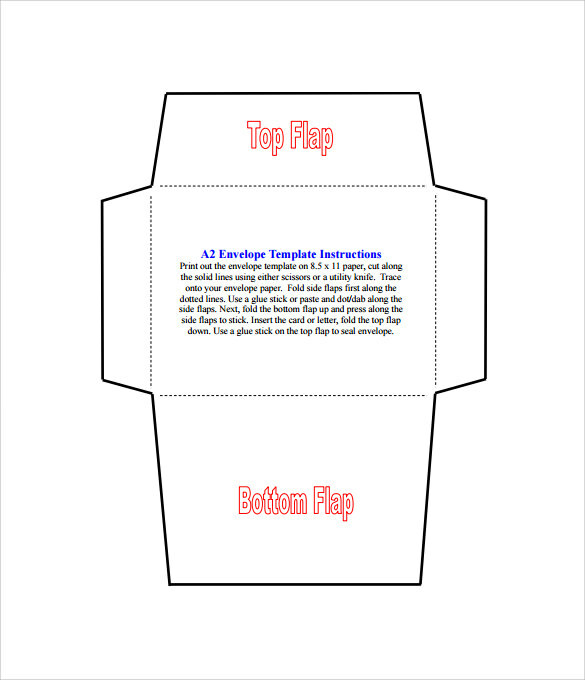 Size specific envelope templates are extremely hard to make because there is a special feature of these, that is, these can be made into real templates, so it becomes very complicated.